Previously, the guides for SAP Business Suite on SAP Adaptive Server Enterprise were available on the SAP Service Marketplace. This is now changing. All available documentation for SAP Business Suite on SAP Adaptive Server Enterprise is now moving from the SAP Service Marketplace to SAP Help Portal. Why? Due to the move to SAP Help Portal, all guides are now publicly available to everyone. That means for you, there is no need any more to log on to SAP Service Marketplace with a user and password. Furthermore, the format and the look & feel is changing. All guides are now available in HTML format, complete with full-text search and easy navigation. But you prefer PDF? No problem! Just use the PDF download button in the right-hand frame of the HTML Help to get a PDF document. 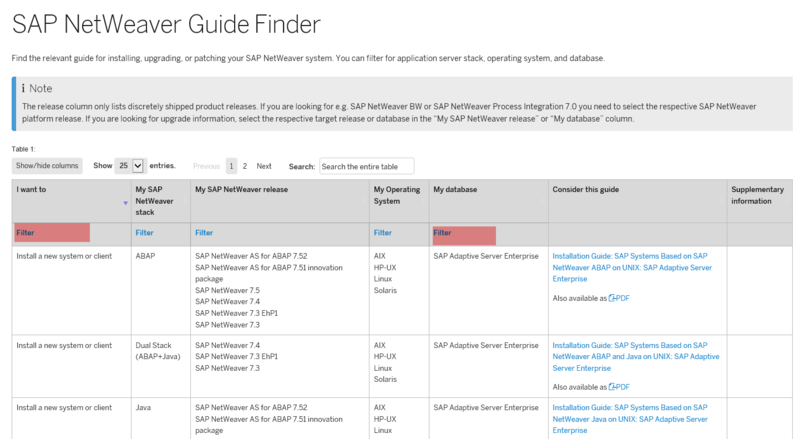 In addition, you can also find our installation guides now using the SAP NetWeaver Guide Finder at: https://help.sap.com/viewer/nwguidefinder. Filter for “Install a new system or client” and “SAP Adaptive Server Enterprise” and you should find them. You want to get your news short and crisp? Follow #SAPASE on Twitter! Thanks Katja Geiselhart for the share.